Welcome to CG Online Tutorials - This is Modo Modeling tutorial category web page and you can find link of a useful Modo Modeling tutorials regarding Character - Modeling A Head - Part 6 - Patching, hosted in other web site. If you want to suggest a tutorial please do contact us, you can find our email address at the bottom of the web page. This part six of video tutorial series created by Dion Burgoyne from Luxology and shows us how to create human head from start to finish using Modo 102. 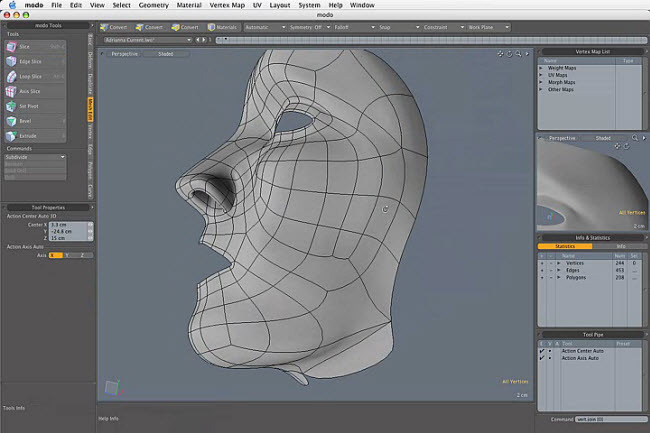 In this part of the tutorial the author shows us how to work on cleaning up the geometry and patching to complete the shape of the face.